Amazon.com description: Product Description: In a culture obsessed with happiness, this wise, stirring book points the way toward a richer, more satisfying life. Too many of us believe that the search for meaning is an esoteric pursuitâthat you have to travel to a distant monastery or page through dusty volumes to discover lifeâs secrets. The truth is, there are untapped sources of meaning all around usâright here, right now. 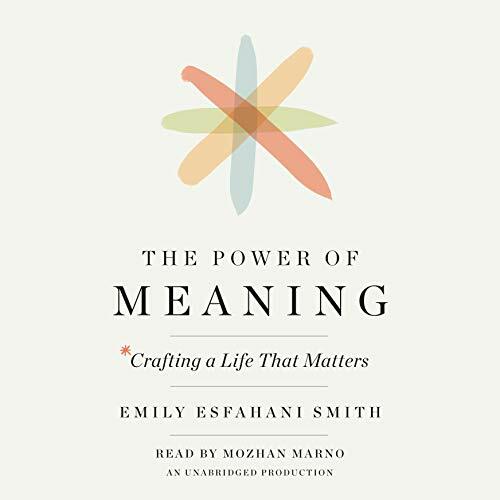 To explore how we can craft lives of meaning, Emily Esfahani Smith synthesizes a kaleidoscopic array of sourcesâfrom psychologists, sociologists, philosophers, and neuroscientists to figures in literature and history such as George Eliot, Viktor Frankl, Aristotle, and the Buddha. Drawing on this research, Smith shows us how cultivating connections to others, identifying and working toward a purpose, telling stories about our place in the world, and seeking out mystery can immeasurably deepen our lives. To bring what she calls the four pillars of meaning to life, Smith visits a tight-knit fishing village in the Chesapeake Bay, stargazes in West Texas, attends a dinner where young people gather to share their experiences of profound loss, and more. She also introduces us to compelling seekers of meaningâfrom the drug kingpin who finds his purpose in helping people get fit to the artist who draws on her Hindu upbringing to create arresting photographs. And she explores how we might begin to build a culture that leaves space for introspection and awe, cultivates a sense of community, and imbues our lives with meaning. Inspiring and story-driven, The Power of MeaningÂ will strike a profound chord in anyone seeking a life that matters. About: In a culture obsessed with happiness, this wise, stirring book points the way toward a richer, more satisfying life.